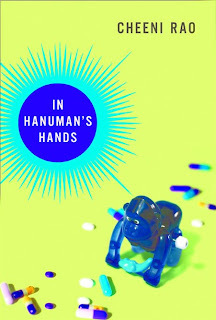 Cheeni Rao's "In Hanuman's Hands"
"So, rather than waste my time going to classes ... I spent most of my time getting high and playing poker. I would walk in on the days of the tests for my premed classes, scribble my answers down as fast as possible, then race out to find something better to do with my time. I was also taking a poetry-writing class, but I'd been writing for a long time before I came to college as a way of dealing with my internal chaos, and so though the poems I created were sorry jumbles of cliche, they at least showed an understanding of basic poetic forms. The instructor was perpetually grumpy, either pissed that getting tenure didn't excuse him from having to teach poetry to a bunch of hacks, or that people only recognized him as the weirdo who had somehow gotten a poem with the last lines 'Put down your flamethrower, honey / you know I always loved you' into the Norton anthology. Since a couple of the students felt it was a class requirement that they talk more than the professor, even if it was only a monologue about the secret meaning of the poem they had scribbled before class, I soon stopped going to that class too." Now who out there in our home audience can identify the author of "Put down your flamethrower, honey / you know I always loved you"? Whatever You Wish To Give (Part 2): An Inglorious Milton? Written and distributed by James Boon Cheatham around 1880, this 20-stanza carrier's address ("Sympathize with the Blind!") incorporates some of the same rhetorical strategies as "A Railroad Boy's Appeal" and "The Wounded Soldier's Appeal" which I've highlighted below: an expressed (though frustrated) desire to labor for one's living as able-bodied Americans do, and appeals to not only Christian charity but to earning one's place in the afterlife. The railroad boy, for example, ends his poem "by-and-by may all we meet / In realms just over there," punning on the word "just" to indicate not only the proximity of that afterlife but the justice he expects to experience when distinctions between abled and disabled are no longer operative. If things are "just over there," then the poem implies that things are not so just over here and that a small donation will help—at least in the short term—to remedy that; the acts of earning capital and earning salvation are parallel if not overlapping endeavors. Indeed, as a quotation in the upper right-hand corner of Cheatham's broadside explains, "Lay up for yourselves treasures in Heaven." A loving Saviour of His grace. Where the blind receive their sight. And battle for the right. A moral compass, the blind person ("I") can hear and delight in the Saviour's "voice"—an act of revelation that privileges sound over sight—but it's the sighted person who has the responsibility (and power) to "make him our [collective] choice" and lead the "battle for the right." The contractual nature of salvation differs depending on one's physical abilities, and the corresponding cultural economics of ability—at least as they are rhetorically positioned—are in the end more complex and more morally entangled than simply flipping two bits to a blind guy. The prevalence of poems like "Sympathize with the Blind," "A Railroad Boy's Appeal" and "The Wounded Soldier's Appeal" in the 19th century popular print landscape would seem to offer the field of disability studies a rich entryway into that period's discourses about ability and disability and the ways that disabled individuals harnessed not just a genre but an entire rhetorical constellation in surviving an inhospitable world via their wits and linguistic capacities. It should also offer literary critics another way to think about how poetry was used within popular culture; it was not just easy reading. In writing about the culture of tipping surrounding 19th century carriers' addresses, I was reminded of this photo of "Poetry for Sale" that I snagged off of eBay some time back. 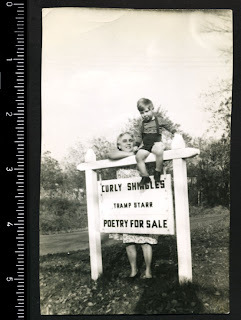 I didn't win the auction, but did find that "Curly Shingles" and "Tramp Star" were pseudonyms for Methodist minister Carl Wilson of Brown County Indiana. In 1941, Tramp Starr wrote what is now his most noted work—a volume titled "Population 359" which is set in the town of Milan, Indiana, home to the Milan High School basketball team of the 1986 movie Hoosiers. For more carriers' addresses, see the very nice exhibit hosted by Brown University at http://dl.lib.brown.edu/carriers/index.html. Also check out Leon Jackson's "We Won't Leave Until We Get Some: Reading the newsboy's New Year's address" at http://www.common-place.org/vol-08/no-02/reading/. Will you please buy my song? In realms just over there. Signed "C.E.H.," the postcard has a footer that reads "PRICE.—Whatever you wish to give." In the more elaborate broadside pictured to the left, "The Wounded Soldier's Appeal," bearer David Gingry, Jr. relates how he was permanently wounded while fighting for the Confederate side in the Civil War. Lest there be any misinterpretation while reading the poem, however, the piece begins with a little prose testimony: "The undersigned, a brave soldier of the army of the Potomac, asks the aid of the people to enable him to support A WIFE AND FIVE CHILDREN, who have no other means of subsistence. He lost his left hand at Petersburg, besides being wounded in his other arm, in his right leg and in the head. Being so crippled, therefore, he is unable to do the day's work of an ordinary laboring man, and the only means left to him to make an honorable living is in selling the following original poem, which he hopes all will be kind enough to buy. He is commended to the generosity of the public generally." Was he who asks your aid to-day. Is more a burthen than a gain. And hopes to meet with no denial. Printed in Altoona, Pennsylvania, the broadside is priced "Ten Cents Each Side." The reverse, in a humorous gesture at a little con, is blank. Both of these pieces are "carriers' addresses" of a different sort than the ones originating with newspapers; instead of recounting the events of the past year, they recount the bearer's story. 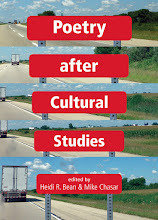 Both types stand to remind us of the popular portability that poetry offered before the "slim volume" and "little magazine" became default media for poems. Is there an equivalent today?